Sharon Strouse, MA, ATR-BC, LCPAT, is a board-certified and licensed clinical professional art therapist with 30 years of experience working with adults in both group and individual settings. She serves as Practicum Faculty with the Portland Institute for Loss and Transition. Her art therapy private practice and national presentations for The Tragedy Assistance Program for Survivors, (TAPS) The Association for Death Education and Counseling, (ADEC) The American Association for Suicidology, (AAS) The American Foundation for Suicide Prevention, (AFSP) and The American Art Therapy Association, (AATA) focus on traumatic loss, specifically parents who have lost of a child, suicide bereavement, and military loss/ Gold Star Families. The creative process, meaning-making and continuing bonds with the deceased are cornerstones of her work. She is author of Artful Grief: A Diary of Healing, (www.artfulgrief.com) written twelve years after the suicide of her seventeen year old daughter. Additional published works can be found in Neimeyer’s Techniques of Grief Therapy: Creative Practices for Counseling the Bereaved, Thompson and Neimeyer’s Grief and the Expressive Arts: Practices for Creating Meaning as well as, Di Maria’s, Exploring Ethical Issues in Art Therapy and Gershman and Thompson’s, Prescriptive Memory in Grief and Loss: The Art of Dreamscaping. She is a board member for the Johns Hopkins Medicine: Department of Psychiatry and Behavioral Sciences. Sharon is the co-founder of the Kristin Rita Strouse Foundation and has a private art therapy practice in Maryland. She is author of Artful Grief: a Diary of Healing, published in 2013. For information on Sharon’s work, see her article “Collage: A Hero’s Journey” in The Art of Condolence issue of the Forum (vol 39, no 4: page 27). I saw Carlos in the morning, during the official opening of the TAPS weekend. I stood with a few others to hear his story. I wondered how he handled the growing attention. I moved through my day in the studio. After dinner I settled into a chair, at one of four round tables and waited for anyone interested in a creative evening. I turned to the sound of the heavy wood door opening and in came Mel and Carlos. In our greeting I remembered the moment I recognized Carlos on TV, for Carlos Arredondo was an iconic face during the Boston Marathon Bombing. He was the man in the cowboy hat who ran toward the explosion, the man who rushed in to pick up and save Jeff Bauman 27, who had just suffered the loss of his two legs in the blast. Mel gathered scissors, paper, glue and magazines. She sat quietly in front of me. 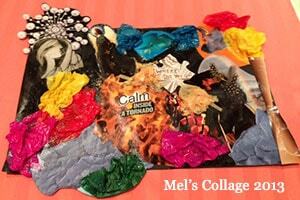 She did not need any direction for she was familiar with the process and settled into the creation of her collage. Carlos stood behind Mel, pacing in the space between the tables of art supplies and the tables where we sat. I asked how he was doing. He began to share his story, it poured from him, as I imagined it had all day. I watched his body in the fullness of gesture, an expression of movement that coincided with the evocative details of his Boston Marathon experience. Mel and Carlos were positioned in the stands at the finish line, there to cheer on those who had run in honor of their sons. Carlos said, "Suddenly something happened, I didn't know what it was but found myself running toward it. I wasn't thinking. I broke through metal barricades, lifted them and tossed them aside. There were body parts everywhere, blood all over." As I listened, I entered a space with Carlos and descended into the underworld with him. "I spotted Jeff, his legs were over there. I looked at the man next to me, a physician." He was part of the staff in place to attend to the runners. "The physician yelled, tourniquet. I started yelling tourniquet, tourniquet. Take off your belts, rip your shirts, make tourniquets. I ripped a shirt and began to wrap it around Jeff's hemorrhaging stumps. I scooped Jeff up, took him in my arms and ran with him toward the emergency tent. A women pushing a wheelchair ran toward me as I yelled for help. I placed Jeff in that wheelchair and continued to run to the emergency tent, where staff urged me to place Jeff in one of the waiting beds. I said no, he will die. I continued to run with Jeff to the waiting ambulances." Mel never turned to look at Carlos in his story telling, but kept her attention in the slow and methodical process of her own creation. She glued a halo of pearls and jewels onto a woman's head and nodded in approval of her husband. Mel said, "In the chaos of the moment, we all ran. When I turned to see where Carlos was, he was not with me. I knew he was running toward the white plume of smoke, into it all." I offered support to them and wondered with Carlos, how his experience might take form in the materials available in the studio. Still standing and pacing, Carlos entered once again into the spiral of sharing and added more details. He focused on the blood. "Blood was pumping out of Jeff. I lifted the tissues that oozed out of his severed legs. I tried to hold it in place. I looked into Jeff's eyes and asked his name. I pleaded with him not to die, as he told me that he looked into the bombers face. Medics ushered him away while the police and FBI began to question me." We talked in general about the "hero in the cow boy hat" and how Carlos was suddenly defined by his physical movement towards the chaos and terror. He picked Jeff up and courageously ran with him, undeterred by his wounds. It was an experience and symbolic of the grief journey he and Mel already embraced. Their intention to heal played out in their actions, that day and in the present moment we shared in the studio. Mel's hands moved over the bits and pieces of paper, gathered into a unified whole, a re-creation of past and present. The creative process called for action, engagement, willingness to give form to suffering, to shape it, glue it down, let it go, make sense and find meaning. (Strouse, 2013) Carlos said, "I like working with my hands, I feel better. In December, when the twenty children in Newtown were killed, I had to do something. I built white crosses for each of them and drove to Connecticut. I created a living memorial by a tree." He seemed to gravitate toward the creative and so I invited him once again to consider what was in the art room, available to him now, in this moment. Carlos got up and selected a large piece of black construction paper and began to sift through hundreds of pre-cut images spread out on long tables. His demeanor softened as he directed his attention into his creation. He joined Mel and sat across the table from her, tearing, cutting and gluing until he was finished. I pulled up a chair and invited them to share. Mel said, "I am the woman whose head is haloed by pearls and jewels, I feel that the holy spirit comes to me." She glued feathers on a dark figure and called him, medicine man. "He is Carlos, now thought of as a cowboy hero." A fire rages in the center of her piece onto which she glued the words, "Calm inside a tornado." Fragile, torn and crumpled tissue paper, represent her sons, "who blessed their Dad, so he was able to help." When I turned my attention to Carlos, I could not believe what he found among the hundreds of pre-cut images, a double amputee in a wheelchair. 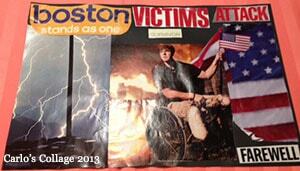 It took up the center of his piece, with the words "victim and survivor," boldly placed on top. Fire and lightening flanked the amputee on the left with American flags on the right. His collage looked one way on the surface, in its reference to Jeff and the Marathon Bombing, and another way when I imagined Carlos as the central figure in his collage. I saw Carlos as the man in the wheelchair who lost both his legs, who lost both his sons and who must now learn to walk without them. Carlos was the one who moved from victim to survivor, the one who survived the fire, the one deemed a hero for entering the unknown. "When we face and engage our pain, it begins to soften and open and change into something else." (Allen, 2005) I noticed that both Mel and Carlos included images of fire, clear references to the fact that Carlos had set himself on fire when he learned of Alex's death. Mel pasted the word calm over the fire. I sensed her layered understanding of the events that had placed them in the heart of a nation and in the heart of a family, whose son was alive. "Art is a vehicle that allows us to transcend linear time, to travel backwards and forwards into personal and transpersonal history, into possibilities that weren't realized and those that might be." (Allen, 2005) The Artful Grief Studio and collage process allowed Mel and Carlos an opportunity to "enact scenes not in order to deny its fragmentation but to reveal it. We could say that the art of trauma is not an imitation of the past but an opening to the future." (Levine, 2009) In the breaking open to death, life and loving was possible. In subsequent weeks I watched Carlos and Jeff throw out the first pitch at a Boston Red Sox game. On Nightly News with Brian Williams, their closeness was highlighted as Carlos supported Jeff during his rehabilitation. Two families were drawn together and each received something from the underworld journey. Allen, P. B., (2005). Art is a Spiritual Path: Engaging the Sacred Through the Practice of Art and Writing. Boston: Shambhala. Levine, S.K., (2009). Trauma, Tragedy, Therapy: The Arts and Human Suffering. London: Jessica Kingsley Publishers. Neimeyer, R.A., (2012). Techniques of grief Therapy: Creative Practices for Counseling the Bereaved. New York: Routledge. Neimeyer, R. A., Harris, D. L., Winokuer, H. R., & Thornton, G. F., (2011). Grief and Bereavement in Contemporary Society: Bridging Research and Practice. New York Routledge. Strouse, S., (2013). Artful Grief: A Diary of Healing. Bloomington: Balboa Press.